A new campaign called Thrive LDN launched this week to help bring mental wellbeing to the capital, and work to end the stigma around mental health. Supported by the Mayor of London, Sadiq Khan, and led by the London Health Board, the project brings together over 200 experts, public and private organisations, to lead a city-wide approach to tackling mental health issues. The launch of the project was prompted by research that highlighted that poor mental health is one of the biggest challenges facing London – with over two million Londoners experiencing mental ill health each year, and just 43% of Londoners with a mental health issue in employment – compared to the national average of 74%. Nearly 90% of Londoners reported that the stigma around talking about mental health had a negative effect on their lives. The project aims to tackle the causes of poor mental health, and enable communities to better help themselves and each other to lead thriving and fulfilling lives. This month the project has launched with initial events including community workshops across London boroughs, designed to help communities develop their own mental wellbeing solutions, and “problem solving booths”, organised by the social enterprise Owls, which encourage members of the public to engage in a conversation about the stressors they are experiencing. As part of the programme, Thrive LDN is inviting all London employers to sign up to having a Mental Health First Aid trained employee in their workplace, available to offer mental health and wellbeing support. 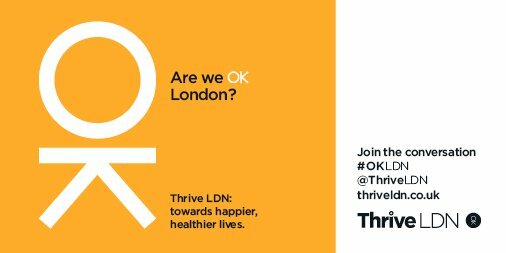 The Thrive LDN initiative will also work to develop phased programmes that will give access to Mental Health First Aid and other forms of training in every borough, so that Londoners are more aware of the signs of emerging mental ill health. To find out how MHFA training might benefit your organisation, read our business case studies here. Molyneux, P. & Bradshaw, I. (2017) Making a reality of employment for people with mental health problems in London. For Thrive LDN.